Regression of a scalar response on signal predictors, such as near-infrared (NIR) spectra of chemical samples, presents a major challenge when, as is typically the case, the dimension of the signals far exceeds their number. Most solutions to this problem reduce the dimension of the predictors either by regressing on components--e.g. principal component regression (PCR) and partial least squares (PLS)--or by smoothing methods which restrict the coefficient function to the span of a spline basis. 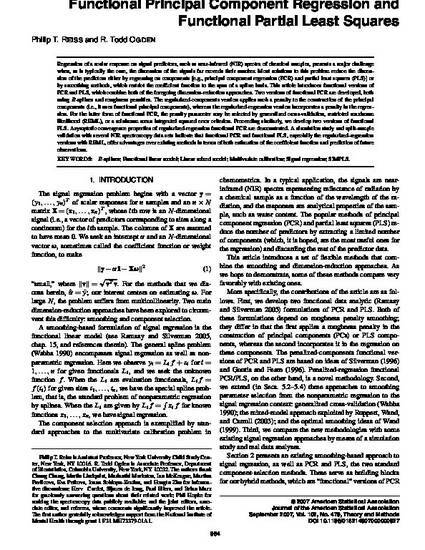 This paper introduces functional versions of PCR and PLS, which combine both of the above dimension reduction approaches. Two versions of functional PCR are developed, both employing B-splines and roughness penalties. The regularized-components version applies such a penalty to the construction of the principal components (i.e., it uses functional principal components), while the regularized-regression version incorporates a penalty in the regression. For the latter form of functional PCR, the penalty parameter may be selected by generalized cross-validation (GCV), restricted maximum likelihood (REML) or a minimum mean integrated squared error criterion. Proceeding similarly, we develop two versions of functional PLS. Asymptotic convergence properties of regularized-regression functional PCR are demonstrated. A simulation study and split-sample validation with several NIR spectroscopy data sets indicate that functional PCR and functional PLS, especially the regularized-regression versions with REML, offer advantages over existing methods in terms of both estimation of the coefficient function and prediction of future observations. Reprinted with permission from The Journal of the American Statistical Association. Copyright 2007 by the American Statistical Association. All rights reserved.